Dorset is perched on Lake of Bays on the narrows connecting Trading Bay and Little Trading Bay. You can get there by car or you can boat in for all your shopping needs. Even the LCBO has a dock! The town is surrounded with spectacular scenery. The single lane bridge in the downtown core is a favourite photo op with views of the lake in both directions. It’s also a popular spot for daredevils who like to climb the bridge and plunge in to impress their friends and onlookers. At the hub of the town is Robinson’s General Store (www.robinsonsgeneralstore.ca). It’s a remarkable general store that has been in the same family since 1921. 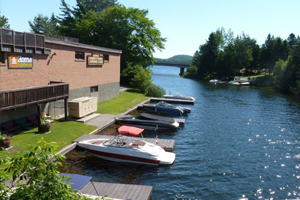 It’s evolved from a typical small town general store to a rambling emporium that stocks everything from gourmet foodstuffs to fishing gear, all while retaining the charming atmosphere that area cottagers have come to love. No trip to the cottage is complete without at least one trip to “the” store. After a visit to the store, you’ll see most people head over to Northern D’Lites for a yummy frozen yogurt to munch on while you watch the boats go past the wharf. The Dorset Lookout Tower is pretty famous as well. In fact, it has become so well known as “the” place to admire autumn colours that there are buses and cars lined up on Hwy.35 for weeks in September, all waiting their turn to climb the tower and catch that breathtaking view. Another popular attraction is the Dorset Heritage Museum (www.dorsetheritagemuseum.ca) at the base of the tower hill. Artifacts and historical information are on display and provide insight into the diverse and rich history of the area. Just down the road, the Dorset Community Centre offers WiFi, a library, squash court and meeting rooms as well as a complete exercise room in the lower level. It’s also the place to watch for community bake sales and fund raising events. There are several park areas in town including one by the waterfront, a new playground near the Community Centre and another children’s play area near the museum. There’s even a baseball diamond beside the fire hall for an impromptu game.